Maximum Load Capacity: 1250 to 2250 lbs. ZL7-4824-3D 48" 24" 84" 2250 lbs. 125 lbs. ZL7-4830-3D 48" 30" 84" 2250 lbs. 144 lbs. ZL7-4836-3D 48" 36" 84" 2250 lbs. 163 lbs. ZL7-4848-3D 48" 48" 84" 2250 lbs. 202 lbs. ZL7-6024-3D 60" 24" 84" 2000 lbs. 146 lbs. ZL7-6030-3D 60" 30" 84" 2000 lbs. 169 lbs. ZL7-6036-3D 60" 36" 84" 2000 lbs. 192 lbs. ZL7-6048-3D 60" 48" 84" 2000 lbs. 238 lbs. ZL7-7224-3D 72" 24" 84" 1750 lbs. 173 lbs. ZL7-7230-3D 72" 30" 84" 1750 lbs. 201 lbs. ZL7-7236-3D 72" 36" 84" 1750 lbs. 229 lbs. ZL7-7248-3D 72" 48" 84" 1750 lbs. 285 lbs. ZL7-9624-3D 96" 24" 84" 1250 lbs. 220 lbs. ZL7-9630-3D 96" 30" 84" 1250 lbs. 256 lbs. ZL7-9636-3D 96" 36" 84" 1250 lbs. 293 lbs. 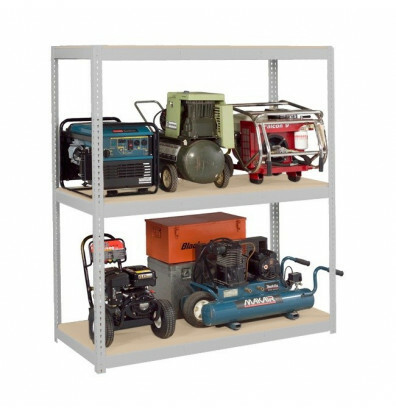 Tennsco Z-Line heavy duty 3-shelf storage shelving unit offers a versatile array of components means it fits all your storage needs. Designed to handle your toughest loads. Combine an interlocking keyhole design for fast, boltless installation without clips, gussets or sway bars and you’ve got a shelving system designed for your specific needs. Maximizes shelf openings in light to medium duty support application. Quick, easy assembly without the need for cross bracing. Tennsco Z-Line heavy-duty 3-shelf storage shelving unit is available in multiple color and size configurations.